This is just a random post of a couple things that I found recently and have really been liking! So I thought I would share! 1. 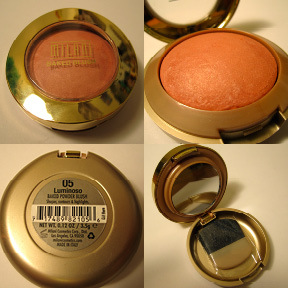 Milani Baked Blush - I found this Blush while I was perusing the aisles of Walmart while looking for Shampoo. I have been looking for a pretty peach blush and so this caught my eye. This picture above unfortunately looks a lot more orange than peach, but I promise it is more of a light peachy pink with just a hint of orange. It also has very small little shimmers in it but it doesn't show of like chunks of glitter in the face at all, more like a little glow. This is my first product from the Milani brand, but I am very satisfied with this blush! It's very pigmented as you can tell from the swatch, which was only two swipes with my finger. 2. 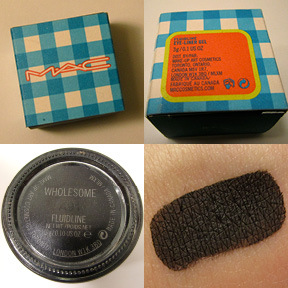 M.A.C Fluidline in Wholesome - This is my very first fluidline from M.A.C. and after trying it I have no idea why I even bothered buying the other cream liners! I have tried Maybelline and Sephora brand. However, this one definitely blows them out of the water! It was very easy to control unlike my Sephora smokey cream liner that calls for brain surgeon steady hands! I love this color because it's not a straight black, it's more of a black/brown and doesn't look as harsh on with my light skin and blue eyes. I use a Bare Essentials small eyeliner brush to apply it. I would definitely recommend this to any of my friends! I bought it from my M.A.C counter at my Macy's for $14 or $15, which sounds like a lot for an eyeliner but a little goes a long way when you apply it so this should last a very very long time! *Oh! I almost forgot, this is from their limited edition MAC shop, MAC Cook collection that they came out for Spring 2012 so hurry and get it before it's gone if you like it!